A surprise birthday party can make you feel pretty important. Only someone who thought your birthday was extra special would spend a lot of time and money on arranging a party for you. 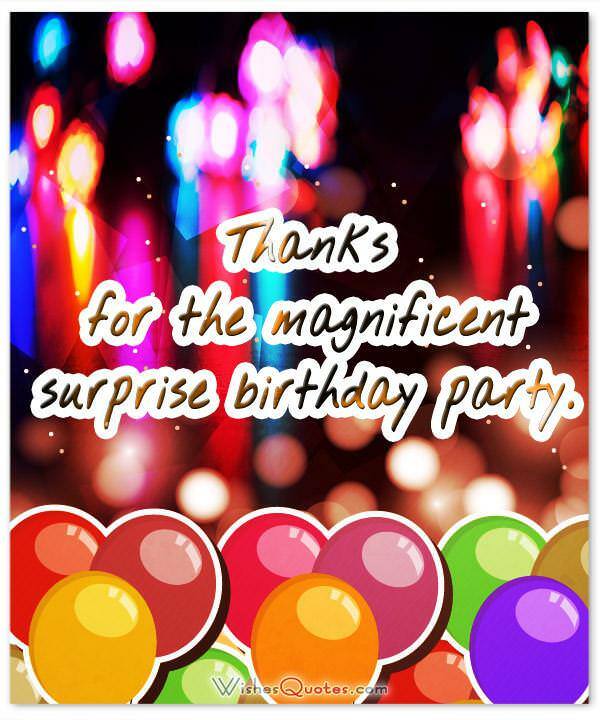 Organizing a party for a dear friend or family member is a lot of work, and although the party planner expects nothing in return for his efforts, this person deserves more than a thank you. With that in mind, the next time someone gives you a surprise birthday party, show your appreciation with a gift. Give this person something you are sure he will like, and attach a heartfelt message of thanks to it. If you should have difficulty finding the right words to say, look through the messages below. All of them are warm and sincere. Choose one you like best. Dearest (name), you made my birthday extra special with a surprise birthday party. Like your thoughtfulness, my gratitude cannot be measured. You’ve sweetened my life with a fabulous surprise birthday party. It’s one I will always remember. Birthdays are more enjoyable when friends and family are present at your surprise birthday party. Thank you for making mine joyous. When you are surprised with a birthday party you really feel special and loved. Thanks for making it happen. The grand surprise birthday party you threw for me makes me thankful for having a wonderful person like you in my life. The wonderful surprise birthday party you gave me made me realize getting older isn’t so bad when you have a great friend like you. You are appreciated. I cannot find words adequate enough to express my appreciation for the lovely surprise birthday party you gave me. If someone asked me what my favorite birthday was, I would have to say the one I just had. Thanks for the magnificent surprise birthday party. You did your best to make my surprise birthday party a day of sheer happiness. You totally succeeded, and I am totally thankful. I didn’t know it was you who planned my surprise birthday party, but I know how grateful I am for all you do for me. You brought me together with those who love me by arranging a glorious surprise birthday party. Your kindness is so very much appreciated. I never had a surprise birthday party before, but I always wanted one. Thanks for fulfilling my desire. I’m not smiling because I am another year older. I’m happy because you gave me such a magnificent surprise birthday party. Nothing is better than having your birthday remembered with a surprise birthday party. Thanks for this pleasant surprise. Surprise birthday parties are fun, cool, and special. 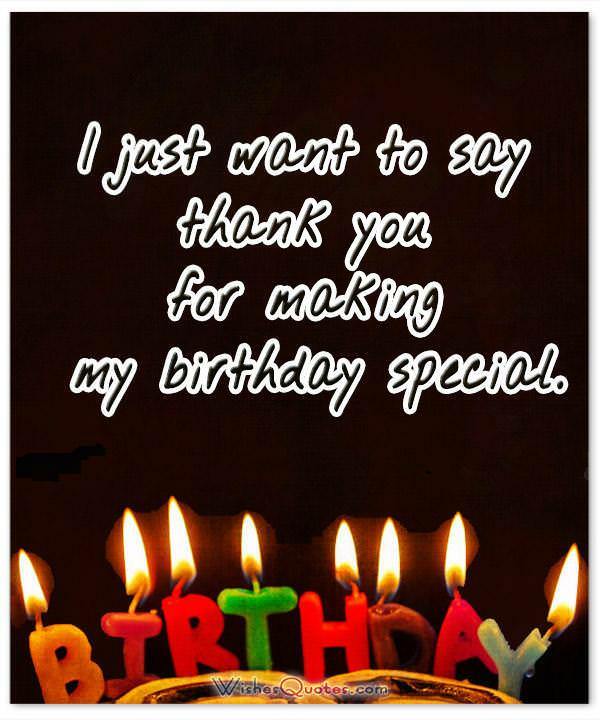 You arranging one for me was thoughtful, kind, and very much appreciated. I should have known my birthday would be extra special with you around. Thanks for the wonderful surprise birthday party. You gave me a birthday party and what a surprise. My gratitude is deeply expressed. Surprise birthday parties come from the heart, and I’m so glad my party came from yours. You surprised me with a party I’m grateful for. You made my birthday joyous in a very special way. I never imagined a surprise birthday party could make me so happy until you gave me one. I am so grateful. You’re never too old to enjoy a surprise birthday party, especially when it comes from someone as extraordinary as you. Many thanks. Thanks for the surprise birthday party, and thanks for the happiness you brought my way. The party you gave me on my birthday was a wonderful surprise. Bless you. If everyone had a surprise birthday party like the one you gave me, they would look forward to their birthdays. So wonderful and so appreciated. Until I was surprised with a birthday party organized by you I never knew what I was missing. I appreciate the enlightenment. I am grateful for the surprise, the birthday party you kept disguised until my special day. Fortunate am I to have a friend as dear as you, one who devoted precious time to creating a surprise birthday party for me. How grateful I am for the surprise birthday party you put together for me. It was joyful beyond compare. I am forever thankful for the fun surprise birthday party you thoughtfully arranged for me.